Forgive me, Mother Earth, for I have sinned. I have killed one your cutest and most bushy-tailed creations. This morning, while driving Precocious Daughter to her music lesson, I ran over a squirrel. It was an accident. Someone stole my car. There was an earthquake. A terrible flood. Locusts! IT WASN'T MY FAULT, I SWEAR TO GOD! Use of deadly force was approved! 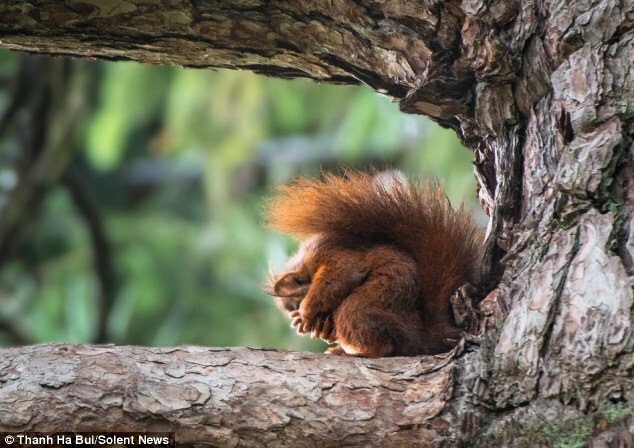 To be fair, Mother Earth, you created squirrels to possess intelligence in inverse proportion to their adorableness. They are, in fact, very stupid. Sure, they instinctively know to gather nuts each year and hibernate during the coldest part of winter and even how to make little squirrel nests to raise their squirrel babies. But couldn't you have given them some sort of basic survival instinct, as well? Or, alternatively, some sort of natural protection? The road I was driving on was smooth and wide and had excellent visibility. So I saw the little critter scampering across, heading for the median. He was 18 inches from safety - a mere moment at scampering speed. All he had to do was keep going. But no. He stopped, directly in the path of my left front tire. Now, I had time to slow down, and I had space to swerve out of the little guy's way. Had he either resumed crossing or stayed where he was, I could have avoided him. 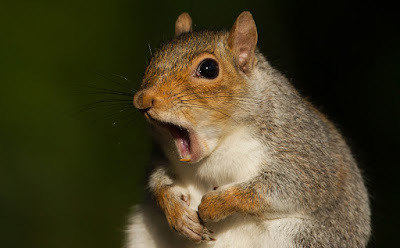 Mother Earth, why did you give squirrels the natural ability to choose precisely the worst option for their own survival? 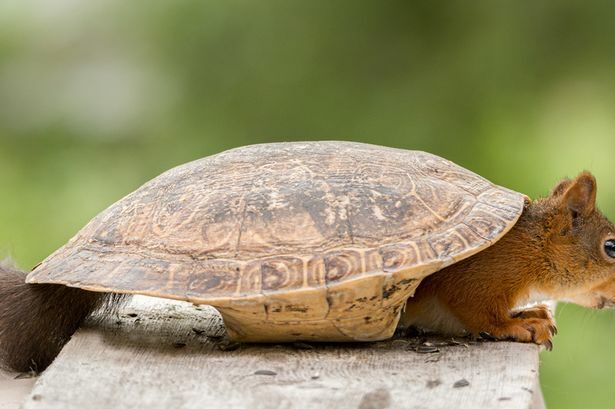 Why, instead of running a couple of feet forward, did this little squirrel decide to turn around and go back the way he came? PDaughter and I watched, horrified, as this fluffy-tailed idiot made a beeline for the exact spot where my right front tire could take him out. Which is exactly what it did. PDaughter screamed. I screamed. There was nothing I could do. We heard a small thud! And when I looked in the rearview mirror, I saw his little lifeless body, somewhat flattened, lying in the road. And then I saw the car behind me run over him, too. "You hit him! You hit him!" PDdaughter shouted. "I know! I'm sorry I'm sorry I'm so so sorry!" I wailed. "You stupid squirrel, why did you do that?" That's right. I blamed the squirrel for his own demise. I'm not one to shame the victim. But it's not as if he dressed provocatively or let me pay for dinner or walked alone in a bad neighborhood. But he had two strong options for survival (three if you count not crossing the goddamn road in traffic in the first place), and he blew them off. 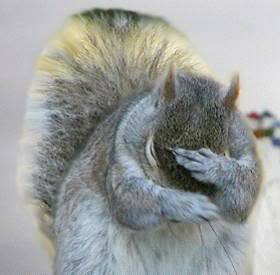 *sigh* Jerry never was the smartest squirrel in the tree. That squirrel's death was quick and (I hope) painless. I, on the other hand, am traumatized and have to live with accidentally facilitating the creation of roadkill on what should have been a pleasant and uneventful drive. I think I deserve some sympathy here. So forgive me, Mother Earth, for offing one of your furry children. In my defense, I think I've made a valuable contribution to natural selection. Perhaps my children's children's children will behold the wonder of the armored squirrel, impervious to smooshing. 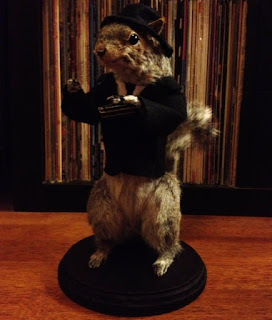 Perhaps I've helped hasten the rise of the all-powerful squirrel army that someday will enslave mankind force humans to work in filthy walnut mines in the service of squirrelkind. All in a day's evolution. 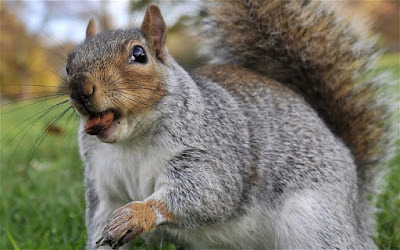 If only that squirrel had looked like a hagfish, he'd probably have run over you. I try to avoid killing any living thing but having spent thousands of dollars repairing squirrel damage I find it extremely difficult to feel bad about this. To paraphrase Mark Twain, I have never wished a squirrel dead but I have viewed some roadkill with great pleasure.